You can still save today and tomorrow during Summer Sale 2016 from Vera Bradley. 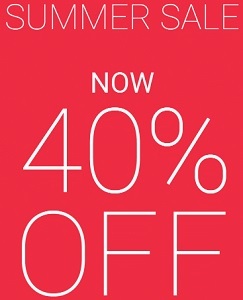 Enjoy up to 40% off original retail prices, valid on selected styles. Plus, get an extra 20% off your sale purchase. Offer is avaliable at Vera Bradley stores in the U.S. and Vera Bradley online. Offer is valid until Sunday, June 12, 2016. Source of the information is Vera Bradley. For more details visit any Vera Bradley store location or Vera Bradley online.